Its been ages that I have posted anything. There is lot to talk about. I have attended a Indiblogger meet at Trident. The meet was organized by Stayfree, UNICEF and Indiblogger. The meet was for the women bloggers only. The meet was about Women for change.This was my first blogger meet. The meet was very interesting and insightful. Coming back I have decided to be regular on my blog. I do have lots of creative work to talk about but somehow not able to find time to write and post. 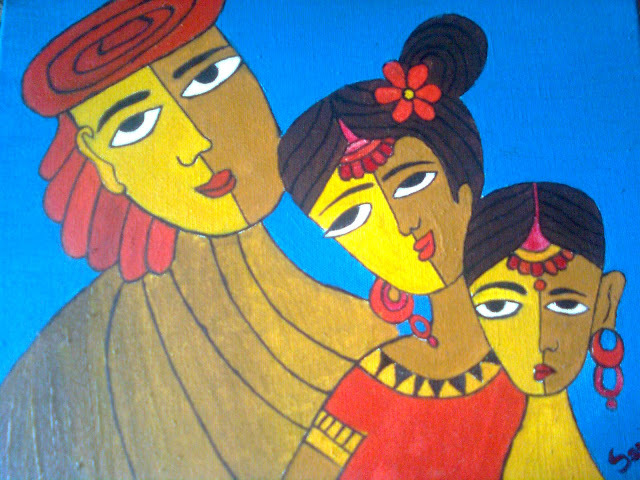 I have made this paining 2-3 years back. I have made this on canvas using oil paint. Hope your weekend will be a very special and fun filled one. Have a great weekend ahead and stay creative friends!!! The painting is beautiful. You must let me know the basics of it atleast. I paint but very randomly..once in a year perhaps and that too at a very basic level. Maybe, I shall put up something too on my blog.